Washington to Texas Freight shipping and trucking services are in high demand; Seattle to Houston is a very heavily traveled route. The Seattle, WA to Houston, TX route is a 2343 mile haul that takes more than 34 hours of driving to complete. Shipping from Washington to Texas ranges from 1510 miles and 22 hours from the Kennewick, WA area to the Amarillo, TX area, and over 1600 miles and a minimum of 23 hours on the road from the northeast area of Bellingham, WA close to the Canadian border to the southern Texas region of McAllen, TX. The shortest route from Washington to Texas is along I-84; however, there’s also a more northerly route that uses the US-93 N, coming through El Paso, TX and passing through Las Vegas, NV rather than Denver, CO.
No other state moves materials like Texas. Not only is Texas geographically the largest state in the continental United States, it also draws the most revenue from exports. Most of its major industries are in the natural resources, agricultural, and manufacturing sectors, which means that freight never stops flowing. We hear that Texas even takes cargo into orbit every once in a while. Texas spans seven major geographic regions ranging from sun-blasted deserts and hill country to semitropical coastal plains. Cities like Austin, Houston and Dallas dominate the state’s economy and consistently attract new businesses. Due to its size, shipping across the state is a taxing job, but Freight Rate Central’s trucking and freight team are more than up to the task. 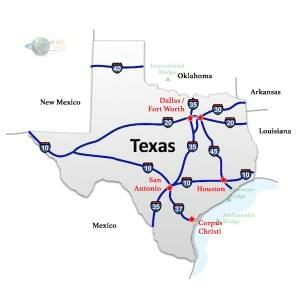 No matter the size of your order, we can move your cargo through Texas quickly and professionally. Washington to Texas Freight shipping quotes and trucking rates vary at times due to the individual states industry needs. Since Washington is more agricultural with Texas being mainly industrial, with manufacturing and distribution centers throughout, we see plenty of shipments by Flatbed as well as by the more common dry van trucks. 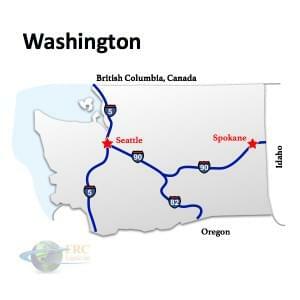 Our Less Than Truckload (LTL) carriers in both Yakima, Washington and Dallas, Texas are also running a number of regular services between the two states, and it’s an active route for heavy haul freight shipments, as well.